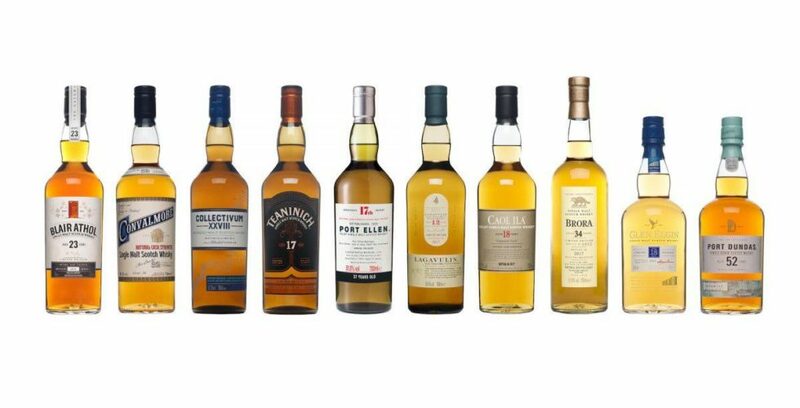 A week later than expected, here’s my top five drams from the Diageo Special Releases launch. More famous as the spiritual home of Bells, this is the first new release of Blair Athol since 2003.Originally founded as Aldour in 1798, it was one of the first distilleries with a visitor centre, although is rarely seen out with Diageo’s Flora and Fauna collection. This new release comes from ex-bodega European oak butts which were filled back in 1993. The European oak heritage is clear to see in the deep, ruby red colour of the bottling. There was plenty of toffee, caramel and crème brûlée on the nose, but I also got strawberry and mint, with a slight nuttiness too. The palate was very rich and smooth, with more caramel and a slight spice. The strawberries were back on the palate too, although this time they came with balsamic vinegar. Another release from one of Diageo’s silent distilleries, which only closed in 2009. Port Dundas was located in the heart of Glasgow – just next to the M8. One of the country’s most respected grain distilleries, it was established in 1811-13, however it fell victim to Diageo’s consolidation operation in the latter half of the 2000s. This release, which is more than half a century old, is the oldest ever Special Release to date, with just 752 bottles produced. And what to say about it? Well, it’s an absolutely fantastic bourbon! Lots of sweet oak and vanilla flavours on the nose, with molasses and a touch of spice. The same flavours are present on the palate, with a very creamy texture and that extra kick of spice. As I said, a fantastic bourbon…although the price tag is a bit steeper. The now legendary Port Ellen returns for the 17th time with another stonker of a release. Hailing from the whisky island of Islay, Port Ellen closed its doors in 1983, meaning releases from the distillery is highly sought after. There’s plenty more to be said about Port Ellen, but nothing much more than has been said before. This release is another fantastic example of the whisky which the distillery continues to release. There’s Islay smoke on the nose, but it’s light and welcoming, with a touch of leather and a sherbet lemon zing. The palate is beautifully smooth, with the earthen smoke giving way to dark chocolate, green apples, more lemon and a slight spicy kick. Get this while it lasts! Another appearance for Caol Ila’s unpeated expression which is from a batch made just once a year. This is the 12th time this has appeared as a Special Release and, although it’s the oldest expression so far, it comes with a highly affordable price tag. This was one of my favourite bottlings back in 2015 and it’s the same this time round. Although the barley is unpeated, I love how the distillery still manages to inject some smoke during the distilling process. This gives it a very meaty mouthfeel, with a sharp, prickliness of lemon zest, along with a vanilla sweetness. The palate has the warming character of a lightly peated whisky, which a mix of sweet (boiled sweets), sharp (lemon, again) and salty characters. If you’d told me at the start of the evening that the Glen Elgin would end my being my favourite, then I’d never have believed you. But, for me, this tops all the rest. Founded in 1899, it was the last distillery to be built in Speyside for 60 years, and today is most closely associated with the White Horse blend. This third release from the distillery’s stocks is a combination of two batches – one distilled using Pombe yeast, with the other using more conventional cerevisiae yeast. Whatever this combination of liquids does, the nose is like walking into a school tuck shop – lots of banana foams, rhubarb and custard pieces and fruit salad chews. Perfectly temping for my sweet tooth. The palate is equally smoot and sweet, with lots of honeycomb, brown sugar and icing sugar, along with dried orange peel and more sherbet. Another fantastic collection of whiskies from Diageo’s massive reserves. Roll on 2018!! I was a guest of Diageo at the launch of the company’s Special Releases range.